Bayou Classic, Premium 10-gallon Brew Kettle, 6-pc set, is designed for the serious All-Grain Home Brewer. 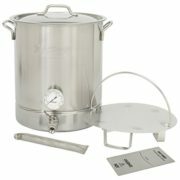 This premium stainless kettle features a tri-ply bottom and includes a domed lid, stainless Spigot with Ball Valve,and side-mount 3-inch Brew Thermometer ranging 60-220 degrees. 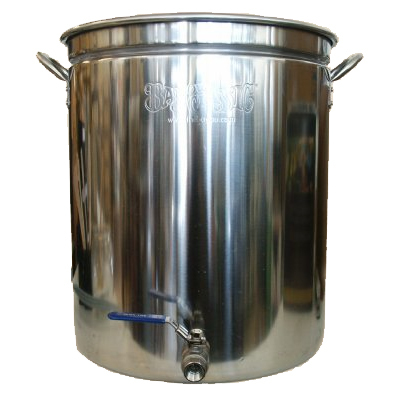 Bulkhead fittings enable easy attachment of thermometer and spigot for a water-tight seal. Side calibration measuring in gallon and quart that read from the inside of the kettle, enabling more accurate water level setting. 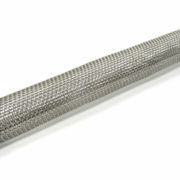 The try-ply bottom promotes even heating and fights against scorching, while the all stainless construction has no interaction with wort or acids. 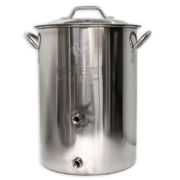 The narrow diameter and high side walls reduce the chance of boil overs; and the false bottom fits tightly on the low side indention to reduce particles and grain from entering the spigot chamber.